Black Gold is another part of Bally’s successful Quick Hit slots series. There are 10! Quick Hits available in land casinos. 4 of them, Quick Hit Pro, Quick Hit Las Vegas, Quick Hit Platinum and Quick Hits Black Gold slot, you can play online for fun or for real money. Black Gold Free Fever, that’s the full name of this slot, is a classic Las Vegas slot. Both in terms of design and the overall gaming experience. All 4 slots have a 3×5 layout, but you can say that Black Gold and Quick Hit Pro are more of the classic slots, while Platinum and Las Vegas are a bit more edgy. 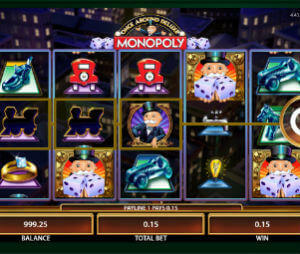 The symbols you will see on Quick Hits Black Gold slot are familiar to any casino player: 7s, Bars, Cherries, Bells, etc.. The special symbols are Free Games; Quick Hit logo which is the scatter multiplier. Quick Hit Fever which activates the Fever Free Games and Locking Wilds which we will explain below. Scatter Multiplier is the defining feature of all Quick Hits. It’s quite simple. To get paid you will need 3 more Quick Hit logos on reels 2,3 or 4. For 3 of them you will get x1 your bet per spin, 4 of them pay x5 and so on. If you are lucky to get 8 or 9 of them you will go home with x1000 or x2500 your total stake! As we mentioned before, Black Gold has 4 Free Spins features. To trigger any of them, you will need to get 3 Free Games Fever symbols on reels 2,3,4. That will get you 10 free spins. Then, you will need to select from a grid of 18 tiles until you match three similar symbols – that will define which of the 4 Free Games features you won. 2x Pays Free Games: As the name implies – here all your winnings will be double. Locking Wilds: In my opinion this is the best feature of Quick Hits Black Gold slot and can be truly rewarding. Each Locking Wild that appears on the reels is locked into position till the end of the feature. Quick Hit Fever Free Games: Additional Quick Hit scatter symbols are added on the reels, which allows you to get up to 11 of them on the reels (vs. 9 during the regular play). For 9 you will get x2500 your total bet, 10 worth x5000 and 11 will get you x7500 your total bet! Quick Hit slots are truly exceptional and Black Gold might be the best of them all (well maybe after Quick Hit Platinum). When they talk about real Vegas experience, that’s exactly the type of slot they talk about. You should notice that Black Gold is a high variance game, which means you can have a relatively long losing streaks and should be a bit careful when playing this slot for real money. However when it pays, it pays well. P.S If you are visiting any brick and mortar casino, then look for Quick Hit Black Gold Wild slot machine – this is the progressive version of the game we reviewed here.